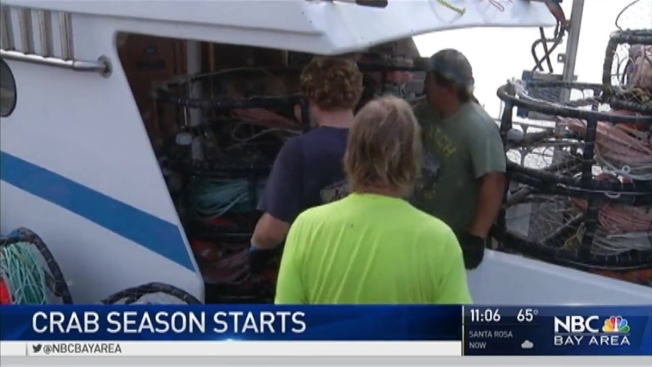 The commercial Dungeness crab season kicked off Tuesday, and plenty of fisherman, including at Fisherman’s Wharf in San Francisco were up early, getting ready to bring in their hauls. "I hope we make some money," Lucas Eaddy told NBC Bay Area before sunrise. "I hope we make some money. Our hopes are up." But Eaddy's good fortune of being able to fish for crab is not necessarily the case for all fishermen along the California coast. According to the Department of Fish and Wildlife, a portion of the coast, north of Point Reyes to the Sonoma and Mendocino county lines, and the commercial rock crab fishery for the coast north of Pigeon Point in San Mateo County have been closed off due to high levels of domoic acid found in crabs in the area. This was a huge issue last year, when the acid was found off the Pacific Coast, closing fisheries from Santa Barbara to the Oregon state line last year. The closure last year lasted through March and caused fisherman to lose millions of dollars in revenue. Tom Mattusch, who was fishing in Half Moon Bay on Tuesday morning, said he needs a better year. And he wants to put crabs on people's holiday tables. "A lot of people are saying there's been a huge swell and it could be some of the areas, the crabs are buried down in the sand. That's one thing we keep telling ourselves," he said. "You get out on the ocean, see so much, almost a limitless bountiful harvest. It's just tremendous to come back and make people happy. We supply so many households with crab." The California Department of Fish and Wildlife says the domoic acid levels are much lower this year. But the affected area will remain closed until officials feel the levels no longer pose a threat.